Ever wonder what those little numbers and letters at the end of your pencil means? They indicate how soft or hard the pencil lead is. A number combined with the letter ‘B’ means the lead is soft black (2B, 4B, 6B, etc.). The larger the number you use, the softer, darker, and thicker your lines will be. 2B-4B: This is the range of pencils that I use for sketching preliminary lines to map out my composition (placing things on the page), sketch basic shapes of the subject, and block in key mid tones. Overall, the 4B is the most versatile pencil for me. It allows me the control to flow spontaneously from thick to thin lines—great for working in a sketchbook. 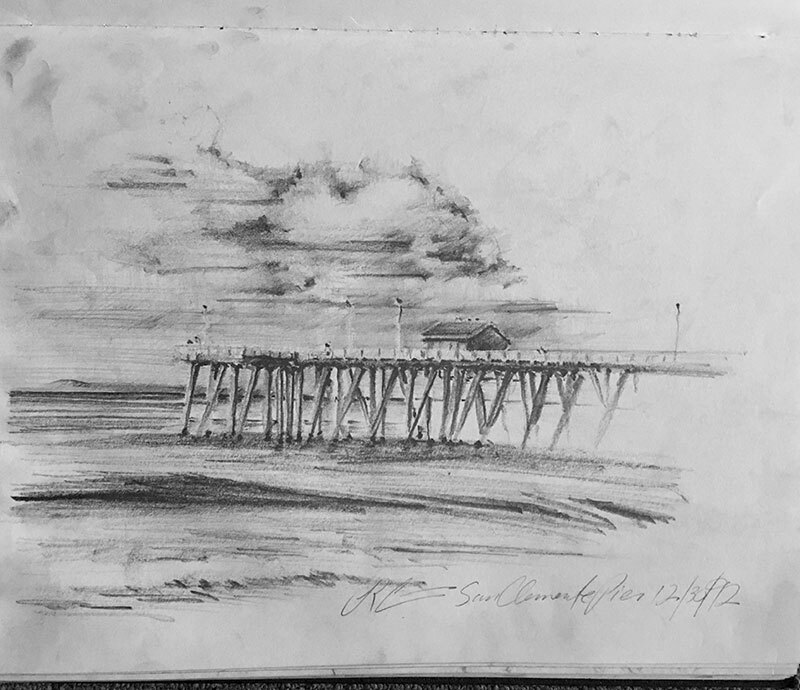 For the sketch of the San Clemente pier, shown above, my 4B captured the various tonal values and movement of the ocean. Typically, I’ll use a sharp-pointed 2B or 4B to render contour edges and textures on more finished drawings. 5B-6B: When I’m blocking in mid tones and shadows that cover a lot of real estate on the page, I’ll usually reach for anything above 4B. A 6B works well when you need a semi-dark tone for layering and smearing graduated tones. This range is also great for shadows cast on the ground by a tree, for example, or when contrast is needed for the textures of clothing. 7B-9B: My favorite all-around sketching pencil is a 9B woodless graphite. It just feels wonderful, delicately balanced in the fingertips. And they look cool, too! Woodless pencils are made of pure graphite shaped as a sleek, black pencil. You can use a 9B to easily sketch through lighter and darker tones by alternating the pressure and sensitivity of your strokes. I love to use the side of the whole pencil point to sweep thick lines; then quickly adjust my wrist and angle of the point for a delicate, tapered contour line. 9B is versatile enough to capture rapid-fire gesture sketches of figure poses or to carefully build up dark tones of the textured shadows in a subway tunnel. Be careful, the lines can get dark on the paper very quickly. A number combined with the letter ‘H’ means the lead is hard (2H, 3H, 4H, etc.). The larger the number you use, the lighter and thinner your lines will be. 2H-4H: I don’t use H pencils too often; mainly because I enjoy bolder, fluid lines that can be varied in tone and smudged a bit. 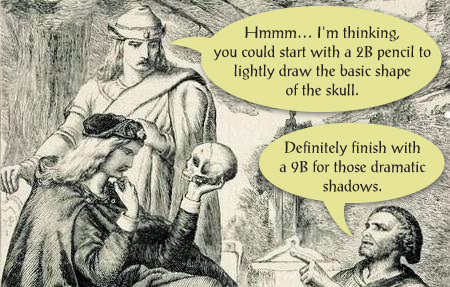 But many sketchers prefer to render initial layout lines with them because of the thin, light lines. This range works very well for extremely technical details such as the intricate textures of hair or the pitted surface of a rock. If you like to erase a lot, beware that H pencils penetrate the surface of the paper quickly, making it difficult to remove lines. 5H-9H: If you’re doing a meticulous, photo-real rendering that requires a spectrum of tonal values, this range of H pencils allow you to slowly build layers upon layers of grays. You can find this selection of pencils on the table of portrait drawing artists, as they’re able to develop the subtle tones of muscle structure and the delicate textures of skin. 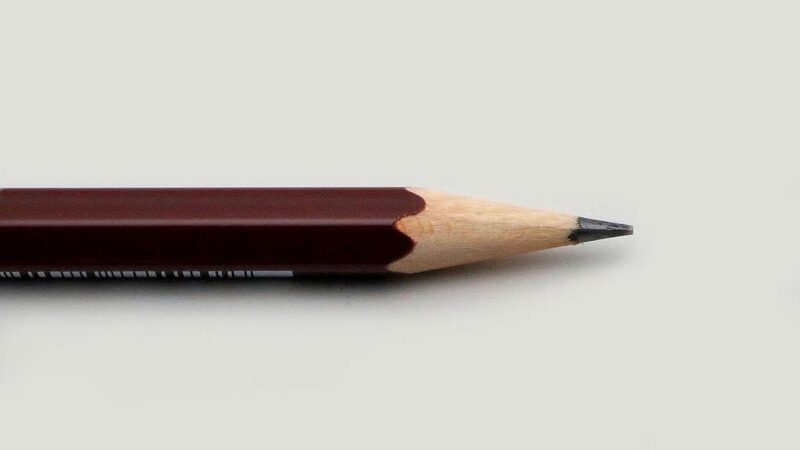 For extremely detailed renderings, H pencils are great for working on smooth illustration board. HB: We’ve all used HB or 2HB pencils since childhood. Truthfully, I still reach for a trusty, yellow Ticonderoga 2HB pencil for a lot of my contour and cross-hatching line work. It’s just comfortable to use and the lead gives me the crispness I need in detail work. I write a lot of notes (outlines, to-do lists, etc.) during the workday. But I can easily shift from writing a sentence to sketching out a visual idea with no conscious effort while using a 2HB pencil. Note: Feature illustration is from the The Gravedigger’s Scene, a drawing by Henry Courtney Selous, circa 1868. Previous PostDrawing Italy: (Part 1) Wherever You Go, There You AreNext PostPrecise or Wonky Lines? Both Are Cool!